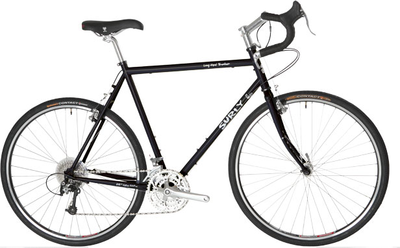 For my trip, I purchased a Surly Long Haul Trucker, with a 58cm frame and 26" wheels. I had never ridden a Surly before but the reviews from the biking community spoke so highly and so unanimously that this was a rugged touring bike, able to handle the load and not lead you astray, that I took the leap of faith. So far I have no complaints. All bike components are those that Surly provided with the exception of the front hub, which we replaced with a Shimano dynamo, the pedals, and the racks, which are not included by the manufacturer. You can see the Surly LHT specs in full by clicking on the image below. Note to Manufacturers: If anyone would like to send me customized components to test out on the road and review, I will be happy to oblige, but doing so does not guarantee a good review. I like what I like and won't endorse what doesn't work for me. I am using the Shimano PD-M520L MTB Sport Pedals for the trip. This is a new experience for me. Prior to this bicycle, I'd never used snap in cleats before. Most people advised me that this was a no brainer -- that the energy saved over such a long trip would be tremendous. I can already tell that this is true, and that they are far far more efficient than pedals in which your foot merely slides in. However there are a couple of drawbacks which still bug me. It requires that I bring an extra pair of shoes. Shoes are bulky, and the bike shoes with mounted cleats can be used for very little besides biking. I have to keep a pair of sandals bungeed to the back of my bike to slip on whenever I park my bike, in addition to the tennis shoes I have packed away for colder conditions. Now, you might say, "Hey--you're biking 15,000 miles...you should probably have specialized bike gear." And of course I hear that. In traffic, they are simply not as safe. Traffic patterns in South American cities can be extremely hectic, and while there seems to be a "bike-friendliness" that is not as present in the U.S., there are not predesignated lanes, and bikers and motorcyclists alike weave in between cars at each light to move to the front of the pack. In the first week of my trip, I took a few spills that never would have happened if my foot wasn't locked into place. For those who have never used snap in pedal cleats before, the release is fairly easy. Simply pop your heal away from the bike and you are free. The process couldn't be easier. ...Unless of course you are already falling to that side. Since those mishaps, I've gotten into the habit of keeping one foot unlocked when in traffic so i can scooter in between cars when necessary. This has worked out for me so far, but I am not yet convinced that lock in pedals are an absolute MUST. Buying front and rear racks was one of the last things I purchased, due to the fact that I had two that were lost on a moving truck somewhere in MidWest U.S.A. that I'd hoped would arrive in time for my departure. Well, that didn't happen (A RESOUNDING TWO THUMBS DOWN TO ALL STATE RELOCATION - who did not deliver on a single point they initially promised) and I had to purchase a new front and rear rack for the trip. I have no beef with my Topeak Explorer Rear Rack . I've used this product in the past and it has held up nicely and fits well with my Ortlieb Panniers. However I cannot understand why front racks are so expensive. I admit that I did not have a great deal of time to research racks, but I was shocked that I could not procure a reputable front rack for less than $110 dollars. Now, I confess I am not in the business of building bike racks. Maybe there are engineering idiosyncracies which I am not aware. I needed a front rack, and you will too if you decide to do serious bike touring. However there has got to be a cheaper product out there somewhere.